Change has been afoot in the Tigers camp, since their 40-6 battering at the hands of Exeter last week, with Matt O’Connor being relieved of his duties as Head Coach. Stuart Lancaster was pictured at Welford Road as Leicester attempted to right the wrongs of their previous performance. O’Connor’s interim replacement – former Tiger Geordan Murphy – may well hold the key to propelling Leicester back up the table, and on today’s evidence, there’s no reason why the Irishman shouldn’t be entrusted with the responsibility of guiding Leicester back to the elite. His Leicester side ran riot against last season’s semi-finalists Newcastle Falcons, withholding a late surge to win 49-33. Saints struggled to wipe out the handling errors that riddled their game from the beginning, and Chris Boyd’s insistence on integrating new recruits into his side from the start looks to be backfiring with new combinations seemingly taking their time to settle. For Harlequins, Paul Gustard said post-match that he was more impressed with this performance than last week’s, but he will surely be disappointed by the nature of Quins’ defeat. After such a promising display against Sale last time out, his team never quite got going in Northampton. Lima Sopoaga being rushed into the Wasps squad only a week after arriving from New Zealand is worthy evidence that his team is short of depth, especially with Jimmy Gopperth’s long-term injury. 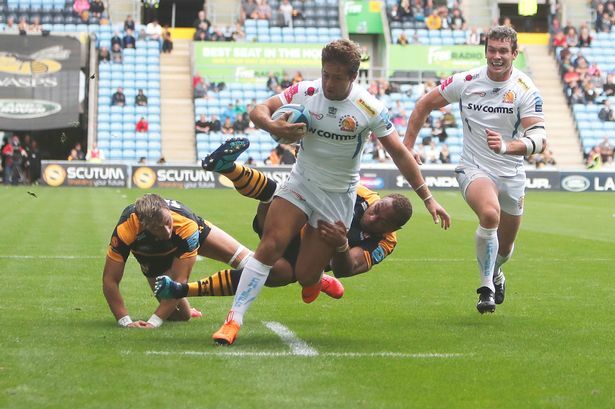 Dai Young’s side struggled defensively against Exeter, and the Ricoh Arena faithful would’ve been disappointed to see that last season’s fallacy remains. Despite this, they can be sure that when Sopoaga and the numerous other star recruits adapt to Premiership life, Wasps will be a force to be reckoned with. Exeter themselves were poor in defence, missing 32 tackles, an extortionately high number for a team that pride themselves on their try-line resistance. Nevertheless, the Chiefs are yet to drop points and there are ominous signs for their competitors. Though he’ll make headlines for his gorgeous try-scoring pass for Matt Banahan’s try at the death, the onlooking Eddie Jones would’ve been concerned by Danny Cipriani’s inability to close out the game from a 21-0 lead. Armed with a dominant pack and supporting playmaker in the back-line, Cipriani was part of a Gloucester team who let slip their 21 point advantage, eventually drawing with Bath at The Rec. Cipriani’s game management has often held him back, and today’s performance will not help his bid to usurp George Ford in the England 10 shirt. Despite their victory over Bath last week, many had written off Bristol before their trip to the Champions. Though Saracens did eventually run out 44-23 winners, Pat Lam will take great confidence from his side’s ability to cope with a powerful onslaught in the first half. Had George Smith not received a red card for making contact with Jackson Wray’s face in a tackle, it could’ve been a completely different story. Saracens once again showed their attacking class, and with Exeter impressing going forward as well, we could have a very high scoring Premiership this season.